James “Monk” Molitor, 68, of Birch Lane in the Town of Port Washington died December 7, 2009 at Columbia St. Mary’s Hospital-Ozaukee Campus in Mequon. He was born April 15, 1941 in Sheboygan, Wisconsin to John and Ann Wilmes Molitor. He married Audrey Fromm from Port Washington on July 16, 1966 at St. John’s Lutheran Church in Port Washington. He worked as a machinist for Bolens in Port Washington until they closed. He later worked for Trac International also in Port Washington until he retired when they closed. 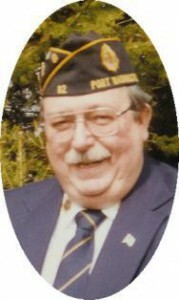 Jim was an active member of the Van Ells – Schanen American Legion Post 82 in Port Washington and the 40 & 8. He was also a member of the Leathernecks, the International Association of Machinist and Aerospace Engineers Local 1430 and a lifetime member of the National Rifle Association. He enjoyed hunting and trap shooting. He is survived by his wife Audrey and children John (Nichole Foye) Molitor of Boston, Massachusetts and Julie Molitor of Port Washington. Further survived by his mother-in-law Alice Fromm of Cedarburg, brothers-in-law Allen Molitor of Milwaukee and Alvin “Butch” (Marilyn) Fromm of Grafton, sister-in-law Elsa Molitor of Port Washington, nieces nephews, other relatives and friends. Preceded by his daughter Dawn Marie, brother Ron Molitor, sister-in-law Alice Jacque and brother-in-law Art Fromm. American Legion services will be held at 5:45 pm Friday, December 11, 2009 at the funeral home. Rev. Tom Lijewski will celebrate Mass of Christian Burial 6:30 pm Friday at St. Mary’s Church, Port Washington. VIsitation 3 – 5:45 pm Friday at the funeral home. Memorials appreciated.